Link building is the life or death of any website. ...whether you need links for your own site or you sell link building as a service... YOU NEED LINKS! Links that keep your clients happy and keep you collecting your agency fees/affiliate commissions/blog visitors, month after month, year after year. "I can build the first batch of links, but after that I'm lost." “I’ve read all the blog posts I can... I still feel like they aren't giving me the answers I need." Before I was forced to go it alone running my own agency, I've experienced all those feelings and more. If you stopped me on the street and told me what my future held for me, I honestly would have told you to f*** off. I wouldn't be able to conceive it. ...and was it worth it? It took a ton of refinement, but I’ve finally streamlined my process, and now work at my business only a few hours per week. Now that my business has a set of standardised operating procedures, I'm going to share with you the exact way I do it. ...it's the entire method that I use to build links for all of my clients (each ranging from £3,000 to £10,000 monthly). I've spent the last three months pulling it together into easy to digest modules, and this is giving you the chance to put it into action for your business. These 3 simple documents provide an almost unlimited amount of "link type" targets. I'm giving them to you exactly as I use them. Every link type is classified between two specific "roles". "It can't be this simple..."
At least when you're starting from scratch. Add years of toiling, refinement, mixed with an intense obsession for automation + simplification... and well this is the result. One currently in use by me for 9 clients (my chosen maximum number) for over £115,000 per month in billing. Now that I'm maxed out on clients, I'm determined to share what I've refined with you. You'll be able to build out your agency in ways you might not have conceived with these processes. 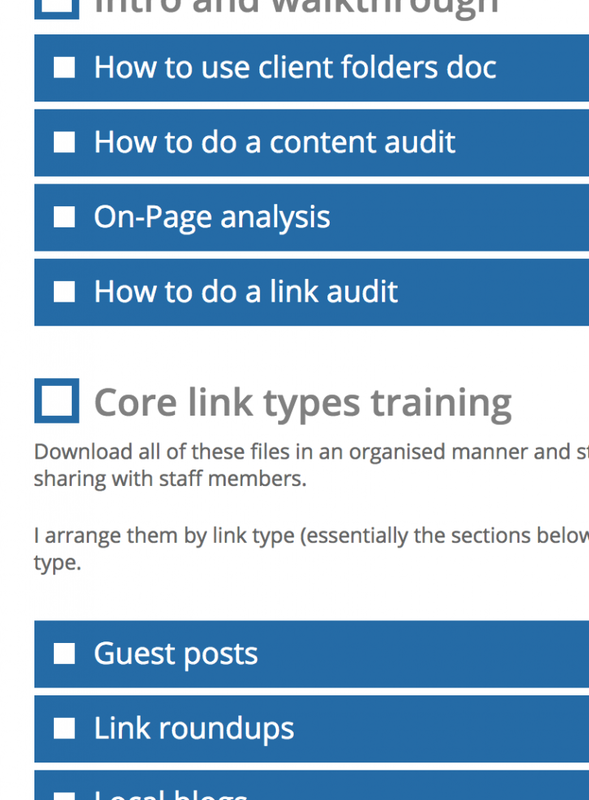 Beyond the detailed documentation, I've created walk-through guides to explain step by step how your core team members will get each type of link. They are literal step by step, data entry level instructions that anybody could follow. Everything about this system has been built to "turn-key" specifications, I make it almost too easy to delegate each task to your team. 1) The Complete Link Rolodex - explains what each type of link is, how it can be used and what type of campaigns it's useful for. 2) Prospecting Step by Step - shows your prospector exactly how to find targets for each individual link type. 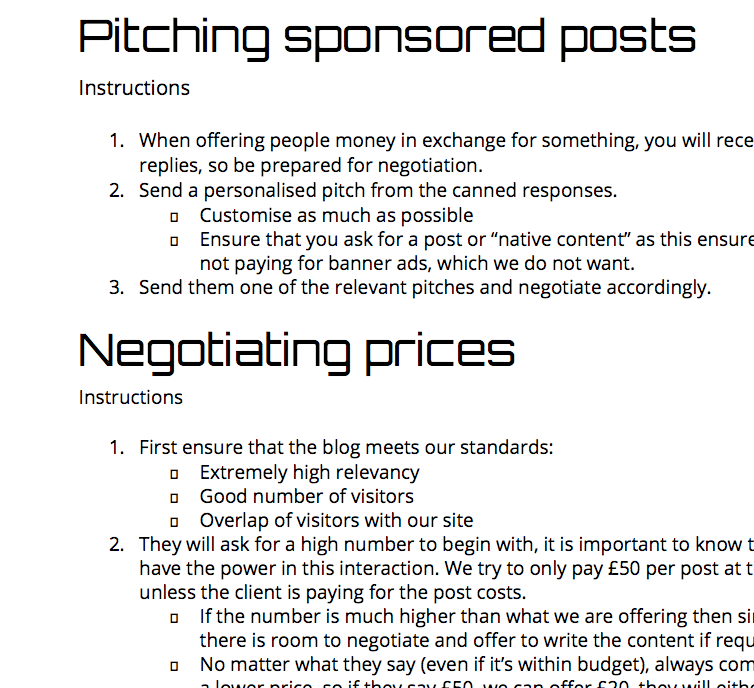 3) Outreach Step by Step - shows your outreach hire exactly how to pitch and negotiate specific link types. You'll receive a comprehensive, easy to understand guide, and "copy-paste" job listings so you can just sit back and wait for the perfect candidates come to you. I also give you copy and paste sample tasks so that you can weed out the people who aren't up to the standards you need. I've designed the system to be beyond simple. You'll have the exact same file structure used by me and my team. Your team will be working while you're spending your time... exactly as you like to spend it. You can also save your favourite lessons so you can easily go back to them at any time for a refresher. "Truthfully, we love the system. From the start of the training right through to the end, it is clear, concise and also provides deeper understanding of link building as a whole. Without a doubt, this system gives you the confidence to know you can build high authority links at scale, meaning you can chase the bigger clients that may have been out of your reach. When dealing with clients who are paying thousands per month, they need to be ‘in the know’ of the processes you are implementing on their site. It has allowed us to focus on the on-page aspects of their websites, whilst the off-page link building is being completed to an extremely high standard because of this system. The system really has been the ‘icing on the cake’ for our agency; LaunchLocal and would recommend it 10x over." "I've purchased and read dozens if not hundreds of online courses, but As soon as I read through Dan's program and started implementing it, I knew this was up there - and with regards to SEO - THE best course you can get hands down! This took a complete newbie like me, to an almost world class agency level within a matter of months. There's nothing stopping me from chasing my 10K a month target now!" You're meant for more than hanging on month to month. Managing clients, and getting them results repeatedly is easy with the right pieces in place. This is your opportunity to use the knowledge I've compiled from years of refining this link building system. I'm proud that this is the only SEO system on the market that focuses on process as well as strategies. For many it's the only shot they'll have at running a scalable business, as most can't suffer through the years of figuring things out. And rightly so, because wasting years of your life to figure out something that's right in front of you would be tragic. It just depends on how much you value your time. I do my best to make all of my deals no brainers, this one is no different. Landing 1/4th of 1 client covers the system. - Freeing up the time to market your content so you can work on producing the best quality for your audience is absolutely priceless. This turnkey link building system will give you all you need to take your business to the next level. The only thing you have to lose is the results you won't see without it. It's time to take action, or walk away. Before I double The Price To £1200! Or try a ﻿FREE version, where I will prove the system by getting you 10 links in 5 hours.